I love it when there’s a label. I’m curious about Mrs. F. C. Brown and what she was up to in 1917. Her skirt is very sensible with pockets and a modest train. The fabric is fabulous. * note on the photo- I’m not giant, the chair is mini – I got it at the flea market a couple weeks ago. It was fun to try on and I was surprised by how good it felt, the way it moved, the pleasant weight of it and how the little train felt behind me, it isn’t in wearable condition though, and I probably shouldn’t add “wears period clothes” to what I already have going on anyway. I’m going to make a collection of things from it, the first is a mrs. brown spider. That skirt is a masterpiece. I think Mrs. Brown would be pleased with its arachnid incarnation! Ann, I’m torn between wanting you to preserve the skirt as the wonderful masterpiece that it is, and using it for your work … it looks like it was made for you! Why isn’t it wearable? If there are holes in the back, I imagine you patching them from the inside with black fabric with crocheted lace overlay (like the spider’s head). What a fabulous thing that would be! I’m so jealous of women who can fit into period clothes … I used to have some skirts & suits from the 40s that I wore some 30 years ago, but they’ve long since been passed on to friends who haven’t … um … expanded. Wonderfull! I found in my attic in Burgundy, an old jacket in the same style, with a similar fabric. That could make a beautiful unit! What are you going to do with the label? I can see it framed (cut out so as to include some of the waistband and fabric) individually or included in a collage. I note that the tailor’s address was on the same street my grandfather’s hat machinery shop was, and the date is three years before my dad was born … maybe that tailor knew my grandfather! Wow I’ve never come across such an old label. I can’t help but think of Mrs Brown and what her life was like. It’s the same as gazing into old mirrors as if everyone else who peered in is looking over your shoulder. Amazing it fitted you so well – wonderful it’s giving life to so many fantastical creations! I wish I had the pattern for that skirt! I want one!!! Great skirt, and very flattering. I’m sure whatever you make out of it will be great too. What a scrumptious skirt! Is the train actually long enough to drag on the ground? I think the skirt makes amazing spiders. I love looking for old and vintage items and then thinking of things to do with them. Ann, I have an absolute overwhelming passion for old fabrics. I would trade almost anything I have for a piece of that skirt — even a very small piece. Is there any way you would be open to a trade or even letting me purchase — say a 4″ square of Mrs. Brown’s skirt? I promise it would be properly loved and cared for and put into something wonderful. 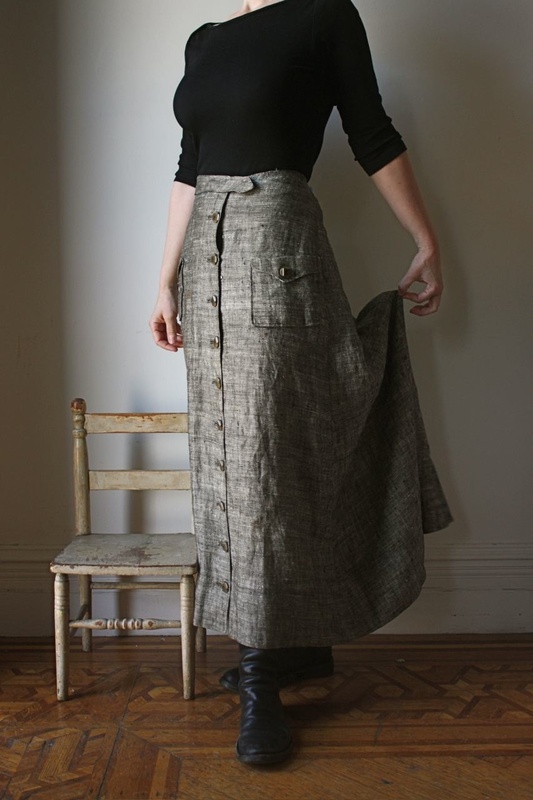 Please another picture of the skirt showing the drape of the train…. any chance a pattern could be drafted for sale of this piece of perfection? ooh ooh ooh!!!!!! the skirt is fabulous, and it looks like you and Mrs Brown were clones! “wears period clothes” that’s funny. A decorator I work for thinks I should sit in his storefront window in period clothing and sew. Maybe if I had that skirt AND fit into it! well Mrs Brown will live on, as a spider, an owl, maybe a sailboat. Thanks! I’m so glad you all appreciate the skirt – I really love it and the tag is such a great bonus. Wearing it is definitely not an option though – it’s falling apart and has some disturbing stainage that wouldn’t come out even after lots of soaking, also it doesn’t fit. Mrs Brown was neither tall or small ( I’m only 5’3″ and I think I would have towered over mrs. b) I’ve got it cinched with spring clamps and clothespins behind me. I’m a first time commenter here and just wanted to let you know how much I enjoy visiting! Your blog and your creativity inspire me so much. Beautiful skirt and I look forward to see all the wonderful things you will do with it! Cinched with clamps, etcetc???? My, my, Mrs. B. must have been a tiny wee bit of a thing with you at only 5’3″, good grief! Such a lovely skirt. Wonder what of life it has seen? A treasure you have found, me thinks. oh i love the spider! i am anxiously awaiting the bats though. i hope i dont miss out! Wow…love that skirt. I would wear one like it in an instant! Maybe you could make a pattern from it before it becomes something else. I find spiders scary, but love this little fellow with his lace head. Mrs. Browns skirt is beautiful and hangs so well. Good idea to cut a pattern from it (or is it already repurposed, is that a bit I see in the body of your latest spider?). Love checking out your finds and what you make with them. spider is gorgeous. are you going to make something with that beautiful label? You look so very elegant in Mrs Browns skirt, it is such a shame that you will be unable to wear it. Would it be possible to take a patter off of it, the cut looks wonderful on you. that skirt fits you wonderfully! but that spider is incredible too. How wonderful – before your blog I never realized vintage clothes like these could be found outside of museums. The skirt is beautiful and could easily be worn today except for the train. I’m so glad you take these bits and transform them into lovely little creatures. I also love reading about old NY – I checked out 8 and 10 West 36th street – it seems to be a restaurant now named Woo Chon – I’m sure Mrs. Brown once lived in a lovely Brownstone.